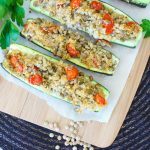 Enticing stuffed zucchini boats! Super-yummy and packed with nutrition, these adorable boats are the perfect way to have fun with kids in the kitchen! 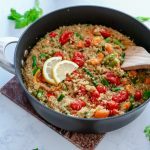 Discover how to turn a simple vegetable into a delicious, and satisfying dish with an easy filling of sautéed onion, garlic, tomatoes, quinoa, and brown lentils. I used a 1 teaspoon sized measuring spoon to hollow out the zucchini. Try to leave a 1/4 inch wall to ensure the stuffing remains inside. Row, row, row your boat……..merrily, merrily, merrily, these are but a dream! 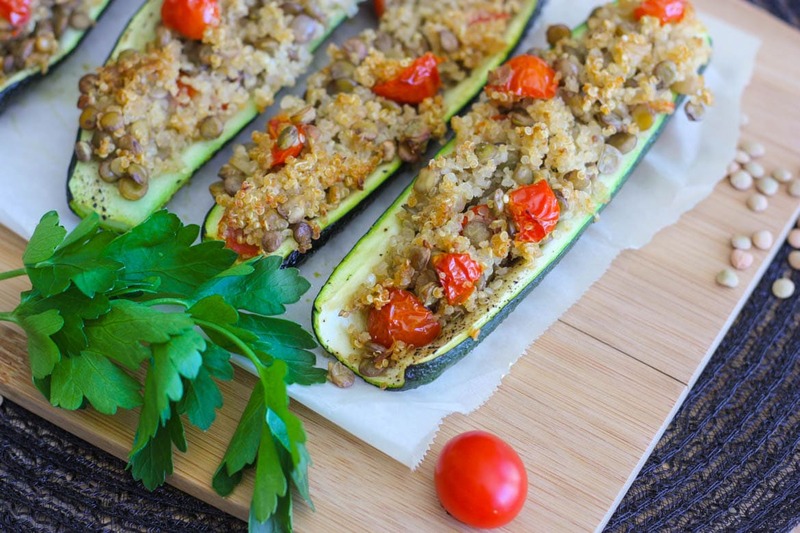 Honestly, we’re hooked on these stuffed zucchini boats. They taste as good as they look. 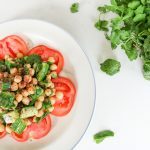 Having struggled cooking with zukes (they turn into an overcooked mess), I was ready to experiment, and find a creative, simple and delicious recipe. 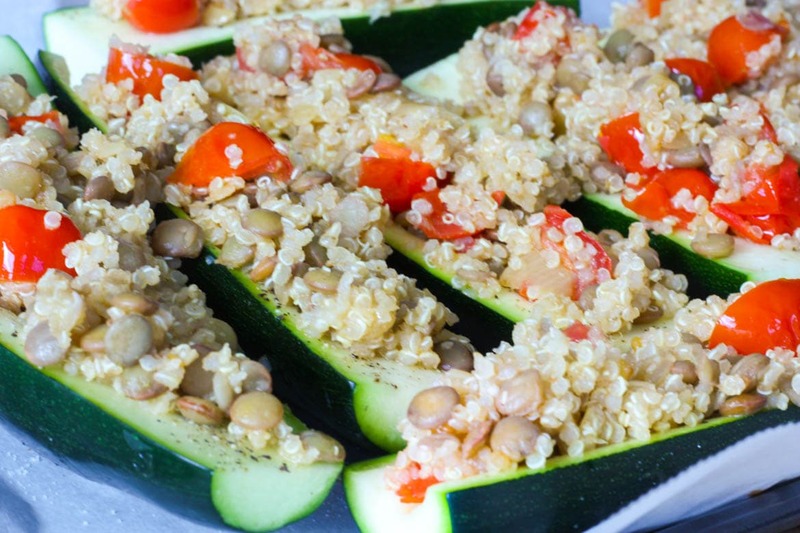 Lately, zucchini boats seem to be the craze. Arn’t they everywhere?! 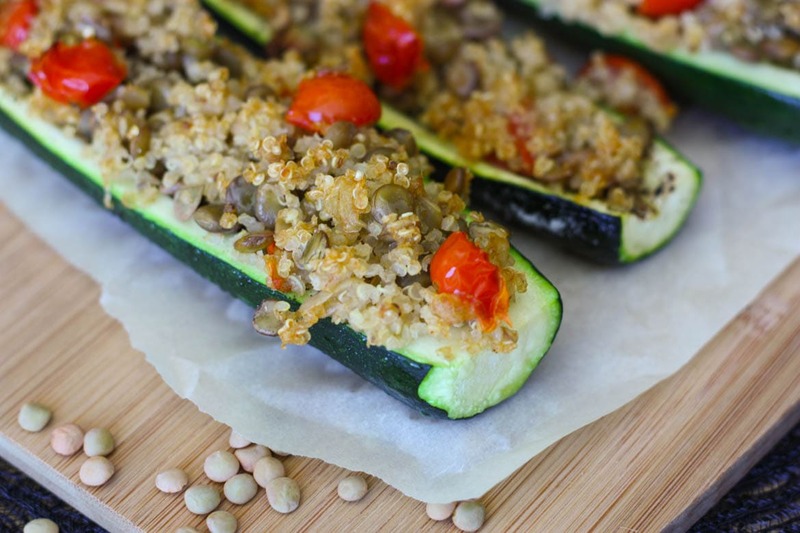 Trying out a a stuffed zucchini boat recipe has been on my ‘to do’ list for a.long.time. And these did not disappoint. So, it all started when Deepak came home with a bag full of zucchini on Saturday. Of course, I now had a reason to come up with a recipe that we’d all enjoy. I love the fact that zucchinis can be a smart swap for refined grains, like pasta or bread AND you don’t end up sacrificing any of the flavour. 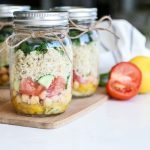 Our pantry always has quinoa and this was an ideal opportunity to put it to good use to assemble a balanced meal – perfect for a light week night dinner or a filling lunchbox option. Any leftover stuffing was enjoyed ‘as is.’ Well, we just couldn’t help ourselves, but nibble. For those of you who follow me on Instagram or are part of my Facebook foodie~licious group, know the kids are very involved in the kitchen. 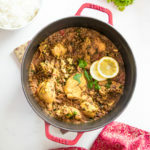 Most weekends, they get their hands dirty batch cooking with me; a great way for us to spend quality family time and for them to learn about food and cooking. Best of all, they’re learning independence, building focus, confidence and taking care of their own needs. 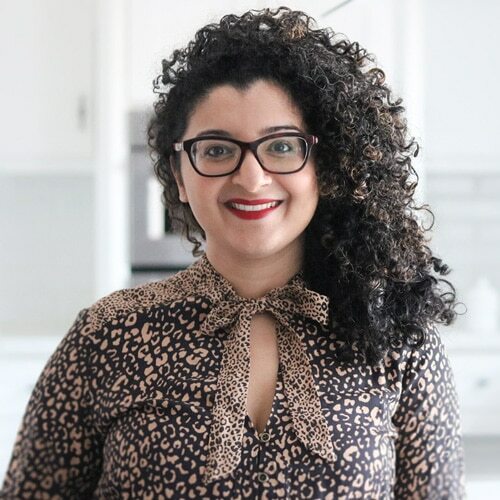 Our eldest, Roohi, scooped out the zucchini, whilst IrshaadKarim chopped the tomatoes and little IzaanAli, our 3-year old washed the veggies and helped with stuffing the boats. It was a fun family affair! Have you tried to stuff veggies? So, kuch kuch hota hai? 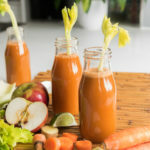 If you try this recipe, would love to hear from you! Leave a comment, rate it, or share a photo and hashtag with #desiliciousrd on Instagram and twitter! Can’t wait to see your photos. Rinse and soak the lentils overnight. Boil the lentils in 2 cups of water for 15-20 mins, or until al-dente. Drain the lentils, rinse with cold water to stop them from cooking further and set aside. At the same time, in a separate pot, cook the quinoa in 1 cup of water. Once it boils, turn the heat to low and place the lid, until all the water has been absorbed. Set aside. Position a rack in the top of the oven and preheat the oven to 400ºF. Line a baking tray with grease proof paper. Using a 1 teaspoon measuring spoon, scoop out the centre of the zucchini leaving a 1/4 inch border on all sides. 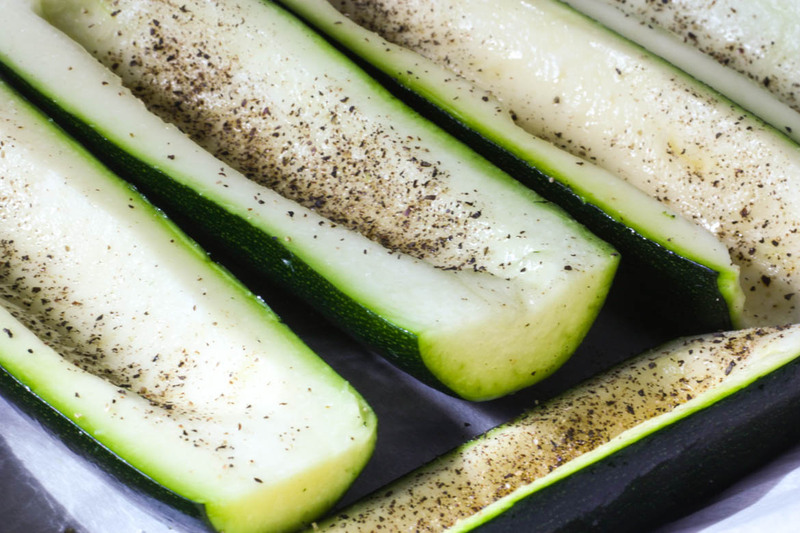 Rub 1/2 tbsp of olive oil over all the zucchini boats. Sprinkle with salt and pepper to taste. 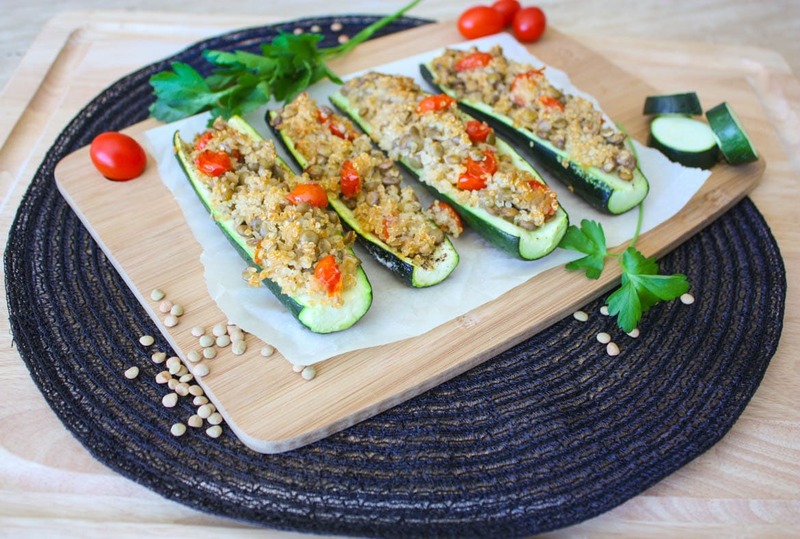 Place the zucchini boats on the grease proof paper tray, skin side down, and set aside. 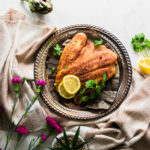 Heat the 2 tbsp olive oil in a pan or skillet over medium high heat. Add the onions, garlic and sauté for 2-3 minutes. Add 1/2 tsp salt (or to taste), cumin, and coriander and stir well for 1 minute. Stir in the tomatoes and cook for 1-2 minutes. Add the quinoa and lentils along with the red pepper flakes and mix well. Divide the mixture into the prepared zucchini boats. Cover with foil and bake for 20 minutes, or until cooked through. 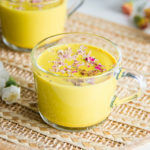 Squeeze fresh lemon juice over the cooked boats and serve whilst hot.